Context: Various factors can hamper the hemodynamic status and the arterial oxygen saturation (SpO2) percentage in patients. Aims: The study has been performed pursuing the goal to compare the effect of two methods, namely, Qur'an recitation and scheduled visits on the hemodynamic status and SpO2of acute myocardial infarction (AMI) suffering patients. Setting and Design: This study was conducted in myocardial infarction patients of Mazandaran heart center. Materials and Methods: The present study is a single-blind clinical trial. One hundred and twenty (n = 120) AMI patients were randomly divided into three groups. For one group, the chanting of the surahs “Ya Sin and Al-Hashr” was played. The intervention group had a 30-m scheduled visit with the desired individuals and the control group did not receive the usual cares. The patients' symptoms of hemodynamic and SpO2percentage were measured before, during, and after the intervention. Statistical Analysis Used: The data analysis was performed using the statistical tests (multiple comparison test of Bonferroni, ANOVA test, and repeated-measure variance analysis). Results: The changes in the respiratory rate and arterial blood SpO2percentage in the pre- and post-Qur' a recitation intervention group patients were meaningful. Quranic recitation improved the symptoms of hemodynamic and the arterial blood SpO2percentage more than the scheduled visit. Conclusion: The medical team can employ Quranic recitation to enhance the symptoms of hemodynamic, to reduce the anxiety, and to improve the arterial blood SpO2percentage. Today, various pharmaceutical and nonpharmacological methods are used to control anxiety and to improve hemodynamic status and arterial blood oxygen saturation (SpO2).,,,,, The pharmaceutical methods accompany lots of side effects, while the nonpharmaceutical methods with fewer side effects have been more focused. Today, imagination therapy, laughter therapy, therapeutic touch, therapeutic oil,,,,, music therapy, relaxation, visiting relatives, and listening to the Qur'an recitation,,, are also used. Through distracting the patient's mind from stressful stimuli, music lowers pain and anxiety. This method modifies the physiological responses., Qur'an recitation as a melodious mystical method with its own particular features and melody and rhythm is of the most magnificent Qur'anic miracle dimensions. Islamic herbalists were used to employ Qur'anic verses to improve their patients in the past times. Diverse studies have demonstrated the Qur'anic chant's effect on improving the cardiac patients' vital signs.,,, In the research cases, the positive effects of the Divine verses on stabilizing the vital signs, boosting the arterial blood SpO2 percentage, and lowering anxiety in AMI sufferers have been pointed out.,,,,, Another measure to reduce the anxiety of the CCU bound inpatients, and heart patients is to visit their family. Nowadays, three models of visit are applied in various communities, including free visit system, limited visit, and scheduled visit., Various studies have been conducted on visit and its impacts on the patients and different results have yielded.,,, The present research aims to compare the effect of the Qur'an recitation and scheduled visit on the hemodynamic status and arterial blood SpO2 percentage of AMI-suffering patients in the CCUs. This study is a three-group single-blind randomized clinical trial with two groups as the intervention and control (Ethics Committee of Mazandaran University of Medical Sciences No. 1306 dated 2015) The study community consists of the AMI inpatients at Mazandaran Heart Center. The participants were allocated in three groups using Excels RAND- BeTWEEN Function. The first eligible patient was designated as number one, and the envelope numbered one was the opened and the patient was allocated to one of the three groups. The samples size was estimated regarding the previous study and analyzing the mean and standard deviation (SD) of the variables as systolic blood pressure, arterial blood SpO2 percentage, and heart rate. Given this point that the number of the samples in the systolic blood pressure is more than that in other groups (due to covering other variables), this variable was employed. Considering the mean variations of the preintervention systolic blood pressure as 127 and SD as 20.1 and the mean systolic blood pressure as 120 and SD as 15.4 of the postintervention in that study and taking the values α = 0.05 and β = 0.10 into account, 35 individuals were estimated in each group. Considering the samples' loss to follow-up and increasing accuracy, 40 individuals in each group and totally 120 were selected for the three groups. The inclusion criteria of this study were as follows: to be Muslim, alert and aware of time and space, able to communicate verbally, the age over 18 years, AMI diagnosis, no artificial pacemaker, the start of admission passing at least 12 h, and with sound-hearing sense. The exclusion criteria of this study were as follows: a history of mental illness and taking neuropsychiatric drugs and drug addiction. Through grouping the patients fully randomly and with no prior notice, the researchers determined 120 cards equally in three colors for the samples' classification. Each patient took a card without re-placing, and based on the card's color, he/she was placed in one of the three study groups, the first of which was Qur'an recitation intervention group, the second as the scheduled visit intervention group, and the third as the control group, respectively. In the Qur'an recitation intervention group, first, the patients' vital signs were recorded, and then, after 30 m, the chant of the surahs “Ya Sin and Al-Hashr” was played for 30 m using headphone and MP3 player. The patients' vital signs were recorded by the researchers at 10- and 30-m time intervals after the intervention onset and 30 min after the intervention termination. In the current research, two tools were used to collect data, including the demographics-medical data questionnaire and the hemodynamic symptoms record checklist. (a) The demographics-medical data questionnaire containing the data such as age, gender, marital status, education, job, residence, underlying diseases, and MI history. (b) The checklist covered the instrument to measure the patients' hemodynamic symptoms including respiratory rate and heart rate, systolic and diastolic blood pressure, and the arterial blood SpO2 percentage. To measure the blood pressure, heart rate, respiratory rate, and arterial blood SpO2 percentage of the patients, patient-monitoring device (NOHVASL800) was purchased from Saadat Company, Iran. To do this, first, all patients' arterial blood pressure was measured in a noninvasive manner and at a half-sitting state and highly relaxed position. The pressure gauge cuff was fitted on the right arm of all patients. The systolic and diastolic blood pressure was automatically measured by the monitoring device and recorded at predetermined intervals. To analyze arterial blood SpO2 percentage, the pulse oximeter probe (Nemoxy 412, Germany) was connected to the patients' right-hand index finger. To determine the validity of the patient's demographics and medical data collection tool, qualitative content validation method was applied. The content validity of the demographics and medical data questionnaire was approved by six faculties. To verity the validity of hemodynamic monitoring devices, the calibration of the devices was figured out. The monitoring device's reliability and validity for measuring the vital signs has been determined by referring to the device's manufacturing plant and using the valid brand and the device's calibration. All monitoring devices in the study medical departments were analyzed and calibrated by the manufacturing technician. In the scheduled visit-based intervention group, the researcher asked the patient to recall the name of two or three individuals most inclined to visit them, and after coordinating with those individuals, they were invited. Before visiting, the researcher took the individuals to a predetermined room and talked about the visiting manner. The individuals were asked to avoid speaking about the stressful statements and memories and talk about sweet memories. Then, the visit was done for 30 m and the patient's vital signs were recorded at the intervals similar to those of the Qur'an recitation group. In the control group similar to other groups, the patients' vital signs were recorded at certain time intervals. The vital signs were recorded at 0, 40, 60, and 90 min. To eliminate every type of bias in the study all of the hemodynamic variables were recorded by the monitoring device, and one nurse. Besides, the headphone and MP3 player used for all patients were identical. In the current research, to analyze the demographics, the descriptive statistics (the absolute and relative frequency distribution, mean, and SD table) was used. To check the patients' hemodynamic sign variations during the intervention period, the repeated-measure variance analysis was applied. The multiple comparison test of Bonferroni was employed for studying the patients' hemodynamic sign variations and the arterial blood SpO2 percentage between the two groups. Furthermore, ANOVA test was used to study the variations of the patients' hemodynamic signs and arterial blood SpO2 percentage in the three groups at various times. The data were analyzed by IBM SPSS 22 software, Chicago. Regarding the sampling randomization, Chi-square test revealed no significant difference in terms of gender and age in the three groups. The individuals' age ranged from 33 to 86 years. In the Qur'an recitation group, most of the individuals were married (n = 35, 87.5%), in the scheduled visit-based intervention group, most of them were married (n = 31, 77.5%), and in the control group, most of them were married (n = 36, 90%). Chi-square test among the three groups did not show any significant difference in terms of marital status (P = 0.436, χ2 = 3.78). Most of the individuals' education in all of the three groups was at elementary level, and this statistics revealed 17 individuals (42.5%) in the Qur'an recitation group and 23 (57.5%) in the scheduled visit group and 18 (45%) in the control group. Chi-square statistical test did not indicate any meaningful difference in the three groups in terms of education (P = 0.151, χ2 = 9.42). In the Qur'an recitation group, most of the individuals (n = 13, 32.5%) were homemakers and retired, in the scheduled visit group, most (n = 18, 45%) were homemakers, and in the control group, most (n = 15, 37.5%) were homemakers. Chi-square statistical test did not exhibit any significant difference in terms of job (P = 0.363, χ2 = 8.755). Most of the individuals in all three groups were city dwellers. This level was n = 30, 75% in the Qur'an recitation group, n = 27, 67.5% in the scheduled visit group, and n = 30, 75% in the control group. Chi-square statistical test did not show any meaningful difference in the three groups in terms of residence (P = 0.686, χ2 = 0.752). Most individuals of the Qur'an recitation group (n = 25, 62.5%) and in the scheduled visit group (n = 27, 67.5%) had underlying diseases, while in the control group, most of the individuals (n = 21, 52.5%) had no underlying diseases. Chi-square statistical test did not reveal any meaningful difference in the three groups in terms of the underlying diseases (P = 0.166, χ2 = 3.857). Most of the Qur'an recitation group individuals (n = 37, 92.5%) and most of the scheduled visit group individuals (n = 39, 97.5%) and all control group patients (n = 40, 100%) were free from prior MI record. Chi-square statistical test did not indicate any significant difference in the two groups in this regard (P = 0.164, χ2 = 3.621). To compare the changes in the systolic, diastolic blood pressure, pulse rate, respiration, and arterial blood SpO2 percentage in the three groups, ANOVA test was employed. The results demonstrated that the systolic blood pressure in all three groups' patients did not show any meaningful changes 30 m before the intervention onset (P = 0.164), 10 m after the study onset (P = 0.428), 30 m after the study onset (P = 0.634), and 30 m after the study termination (P = 0.359). These changes were not meaningful in the control group. Moreover, the patients' diastolic blood pressure in the three groups was not statistically significant 30 m before the intervention onset (P = 0.628), 10 m after the study onset (P = 0.324), 30 m after the study onset (P = 0.539), and 30 m after the study termination (P = 0.658). This test-derived results suggested that the heart rate in the three study groups was not significant 10 m after the intervention onset (F = 1.285, P = 0.280). The results showed meaningful changes in the pulse rate of these individuals at the time intervals of 30 m after the study onset (F = 3.211, P = 0.044) and 30 m after the study termination (F = 4.397, P = 0.014). The mean respiratory rate in the three groups' patients did not show any significant different 30 m before the intervention onset (P = 0.698). However, the mean respiratory rate in the three groups' patients revealed meaningful difference 10 m after the intervention onset (P = 0.013). While the changes at times 30 m after the intervention onset (P = 0.956) and 30 m after its termination (P = 0.052) were not significant. This test-extracted results suggested that the arterial blood SpO2 percentage variations in the three groups at times 30 m before the intervention (P = 0.874), 10 m (P = 0.215) and 30 m after the study onset (P = 0.101), and 30 m after the study termination (P = 0.604) were not meaningful. 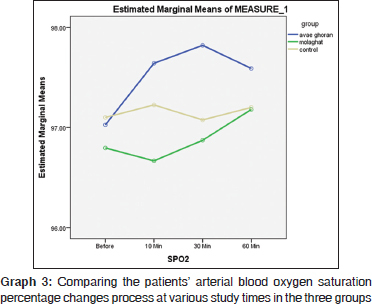 The test used to compare the arterial blood SpO2 percentage variation process in each of the groups was the repeated measure variance analysis. This study-derived results denoted that the patients' arterial blood SpO2 percentage changes in the Qur'an recitation-based intervention group were statistically meaningful (P = 0.0001), while in the scheduled visit group and control group were not significant (P = 0.112, and P = 0.572, respectively). The multiple comparison test of Bonferroni indicated that the mean arterial blood SpO2 percentage changes of 30 m before the intervention onset and 10 m after the intervention onset (P = 0.009) and 30 m before the intervention onset and 30 m after the intervention onset (P < 0.001) and 30 m before the intervention onset and 30 m after its termination (P = 0.002) were statistically meaningful. The multiple comparison test of Bonferroni revealed that the scheduled group's mean arterial blood SpO2 percentage was statistically significant 10 m after the intervention onset and 30 m after the intervention termination (P = 0.018). [Graph 1], [Graph 2], [Graph 3] depict the changes in heart rate, respiratory rate, and arterial blood SpO2 percentage in the three groups, respectively. The current research-extracted results about the patients' mean age in the three groups are consistent with those of a study conducted in Iran, Lebanon, and Egypt, indicating this disease prevalence at certain ages. There was no meaningful statistical difference between the individuals' gender in the three groups, compatible with the study by Emami in Iran and another one in the US. In this study and other ones, the majority of the patients were married.,, In all of the three groups, the participants' education was at elementary level, matching with a study in Iran and inconsistent with another one in Tehran. This difference can be attributed to the cultural conflicts and the economic status of the individuals. The mean heart rate of the patients in the Qur'an recitation-based intervention group, the scheduled visit group, and the control group was 72.23 ± 10.47, 77.35 ± 8.96, and 77.80 ± 11.80, respectively, showing no meaningful statistical difference with each other. In the study done in South Korea (2014), the mean heart rate of the patients in the music-based intervention group and the control group was 76.7 ± 11.3 and 76.8 ± 6.0, respectively, revealing no significant statistical difference with the current research. In the study performed in Shiraz (2012) on the Intensive Care Unit bound unconscious inpatients, the mean heart rate/m in the Qur'an recitation-based intervention group before the study onset was 88.9 ± 3.6 and 86.1 ± 3.1, not consistent with the present research. This difference can be attributed to the patients being different. The patients' respiratory rate in the Qur'an recitation-based intervention group before the intervention onset was 16.23 ± 1.58. This level in the scheduled visit and the control group was 16.07 ± 1.40 and 15.83 ± 1.86, respectively, not statistically meaningful. In the research studying the scheduled visit on the CCU inpatients' vital signs, the mean respiratory rate in the intervention group and the control group was 16.9 ± 1.04 and 17.1 ± 0.92, respectively, being congruent with the present research. In the study on the postopen-heart surgery patients in 2010, the average arterial blood SpO2 percentage of the patients in the intervention group and the control group was 96.9 ± 2.1 and 96.6 ± 2.3, respectively, which is consistent with the arterial SpO2 percentage in the present study. The study-derived findings demonstrated that the systolic blood pressure, the diastolic blood pressure, heart rate, and respiratory rate compared with 30 m before the intervention were not statistically significant. The study findings by Shirvani, analyzing the effect of Qur'an recitation on the CCU bound unconscious inpatients, showed meaningful changes in the patients' systolic blood pressure level after the study conduction (P = 0.04). The study results by Mirbagher Ajorpaz et al., investigating the effect of music and Qur'an recitation on the anxiety and vital signs of the patients before abdominal surgery, indicated significant changes (P = 0.004) in the patients' systolic blood pressure after Qur'an recitation. In the research pursuing the goal to analyze the effect of the scheduled visit on CCU acute coronary syndrome inpatients in 2013, the scheduled visit resulted in meaningful drop of the patients' physiological indicators (P < 0.05). In that research, on the 2nd and 3rd days of hospitalization and everyday 3 times daily and every time for 15 m, the visit occurred. The scheduled visit in that study totally lasted 90 m at various times, but in this study visiting the patient occurred once for 30 m, the issue can make the MI patient getting exhausted. On the other hand, despite the training presented to the visitors, it is probable that foreboding words during the visit result in the patients' systolic blood pressure rise. The present study results showed that the patients' systolic blood pressure changes in the Qur'an recitation-based intervention group at the time intervals of the data measurement were not statistically significant (P = 0.459). Analyzing the diastolic blood pressure changes process in the Qur'an recitation-based intervention group revealed that these changes have declining trend during the study period, so that the mean diastolic blood pressure of the Qur'an recitation-based intervention group before the intervention onset was 87.10 ± 13.42, 30 m after the intervention termination, it got 76.66 ± 13.40. 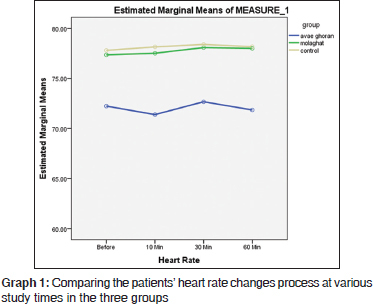 In the study in Jiroft, comparing the Qur'an recitation with interpretation and without interpretation for the patients before anesthesia induction, this conclusion was drawn that the Qur'an recitation did not lead to meaningful differences in the patients' diastolic blood pressure (P = 0.34). The reason behind this difference can be the patients being different. The present study findings indicated that the patients' diastolic blood pressure in the scheduled visit was not statistically meaningful over time (P = 0.353). The study by Rahmani et al. also suggested that the patients' diastolic blood pressure increased during the visit so that their diastolic blood pressure got from 73.6 ± 10 at the time before the visit start to 73.7 ± 8.4 at the visit time, but after the visit ended, it got lower than the level before its start (71.8 ± 7.9). It can be concluded that in the heart patients, visit whatever sort not only does not create any positive changes in the blood pressure improvement, but it also increases these patients' blood pressure. Of the reasons behind this matter, we can mention the patient's rest getting disturbed and recalling daily nuisances. The study-derived results exhibited that the highest heart rate in the patients of the Qur'an recitation-based intervention group was related to 30 m before the visit start, reaching 72.66 ± 12.66. The contradictory results are observed in the study about the effect of music and Qur'an recitation on the patients' anxiety and vital signs before the abdominal surgery in 2009. The heart rate changes process in this study showed a declining trend and the heart rate reached from 78.31 ± 2.4 before the Qur'an recitation reached 71.36 ± 1.2 after the intervention. This decline was statistically meaningful (P = 0.02). In this research, the Qur'an recitation was broadcast for the MI patients for 30 m, which was more than the time duration as 20 m in that research. Considering the present study being done on MI patients, it can exhaust such individuals with no favorable outcome. The study results from the multiple comparison test of Bonferroni showed the heart rate variations during the visit with an incremental trend, so that this group patients' heart rate reached from 77.35 ± 8.96 at 30 m before the visit start to 78.00 ± 9.02 at 30 m after the visit ended. The ANOVA test results suggested meaningful statistical difference among the heart rate of the patients in the three groups of the scheduled visit, Qur'an recitation, and control at 30 m before the intervention onset (P = 0.025), 30 m before its start (P = 0.044), and 30 m after the intervention termination (P = 0.014). Contrary to the present study, results were obtained in the research on the effect of family and friends' visit on the CCU inpatients' anxiety, feeling well, and vital signs (2014). The visit duration was 15 m in that research, increasing to 30 m in the current study, which can be a reason for the patients' heart rate rise. Consistent with this, present results were achieved in the study on the effect of the scheduled visit's effect on CCU inpatients' physiological indicators (2012). The semi-experimental study done in the US with an objective to determine the association between cardiac function (heart rate and abnormal beats) and limited and unlimited visits at CCUs, revealed that the heart rate in the unlimited visit group increased relative to before visiting, consistent with the present study in terms of heart rate rise. The overall results from all studies showed that despite different results of the effect of visit on the patients' heart rate, long visit could bring about the individuals' heart workload increase. 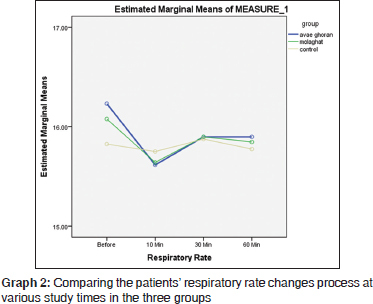 The present study-derived findings denoted significant changes in the patients' respiratory rate in the Qur'an recitation group relative to before the intervention (P = 0.008). Analyzing this part shows that the respiratory rate reached from 16.23 before the Qur'an recitation to 15.58 at 30 m after the intervention. The contradictory results for this research were gained in the experimental study in 2001 in the patients before the anesthesia induction. The semi-experimental study in 2005 on the abdominal surgery candidates indicated that the patients' respiratory rate increased after the music being played. Maybe this difference is related to surgery-induced anxiety, where the MI-induced anxiety is perceived more. The current study derived findings on arterial blood SpO2 percentage showed that the Qur'an recitation led to increased arterial blood SpO2 percentage (P = 0.0001). Consistent with the present study results was achieved in the study on postheart surgery patients' vital signs and arterial blood SpO2 percentage. No research was found in which music therapy or Qur'an recitation could result in arterial blood SpO2 percentage, the issue verifying the current study results. Due to being convenient, accessible, and inexpensive, types of complementary medicine can be an appropriate therapy for patients. One of the methods enhancing the CCU inpatients feeling comfortable and improving the hemodynamic conditions is using the Qur'anic verses recitation. The medical team can apply the Qur'an recitation to improve the patients' hemodynamic signs and reduce their stress and anxiety. Considering that the Qur'anic voice improves respiration and arterial SpO2 in patients with MI, it is suggested that the Qur'anic verse should be used to treat patients according to the religious culture and interests of the patients. Having a visit with family members under convenient and controlled conditions and the Qur'anic verses recitation can stabilize the patients' vital signs and boost their feeling well. Thus, the nurses and the medical team fellows are recommended to employ these methods to proceed with the treatment process. The authors were financially supported by the Research and Technology Deputy of Mazandaran University of Medical Sciences. This project holding No. 1306 on 15 June 2015 was registered in the Ethics Council of the Medical University of Mazandaran. Therefore, the researchers sincerely appreciate the authorities supporting it financially, spiritually, and also thank all the participating patients. Emami-Zeydi A, Jafari H, Khani S, Esmaeili R, Gholipour-Baradari A. The effect of music on the vital signs and SpO2 of patients after open heart surgery: A randomized clinical trial. J Mazandaran Univ Med Sci 2011;21:73-82. Jasemi M, Rahmani A, Aghakhani N, Eghtedar S, Alinejad H. The effect of face to face education on anxiety and hemodynamic status of patients who are candidates for CABG surgery. Razi J Med Sci 2013;20:28-34. Ghaderi B, Daneshkhah N, Vahedi MS. Association between white blood cell count and mortality rate in first 7 days after acute myocardial infarction at Shariati hospital, Tehran. J Qazvin Univ Med Sci 2013;17:11-7. Kamrani F, Seyedjavadi M, Abedsaeedi J, Ezzati J, Alavimajd M, Hoseinian E. Comparison of physiological parameters of patients before, during and after the meeting in cardiac intensive care unit of Imam Khomeini (RA). J Shahid Beheshti Univ Med Sci 2010;20:18-22. Salavati M, Najafvandzadeh M, Ashvandi K, Homayoonfar S. Effect of scheduled appointments on physiologic cardiac intensive care unit patients. J Nurs Midwifery Hamedan 2012;20:43-9. Hashemy S, Zakerimoghadam M. Comparative study of the effect of muscle relaxation and music therapy on anxiety level in patients waiting for cardiac catheterization. Cardiovasc Nurs J 2012;1:22-30. Soltani L, Sabzevari S, Ravari A. The prodromal symptoms in patients with myocardial infarction in cardiac care unit of Rafsanjan Alieben Abitaleb Hospital (Persian). Med Surg Nurs J 2013;2:107-14. Zakeri-Moghadam M, Ali-Asgharpoor M. Critical Care Nursing in ICU, CCU and Dialysis Departments. Tehran: Andisheh Rafie; 2008. Najafi Z, Tagharrobi Z, Lotfi MS, Taghadosi M, Sharifi K, Farrokhian A. Effect of recitation of Qur'an on the anxiety of patients with myocardial infarction. J Evid Based Nurs 2014;4:7-16. Barker R, Kober A, Hoerauf K, Latzke D, Adel S, Kain ZN, et al. Out-of-hospital auricular acupressure in elder patients with hip fracture: A randomized double-blinded trial. Acad Emerg Med 2006;13:19-23. Hamidizade S, Ahmadi F, Asghari M. Study effect of relaxation technique on anxiety and stress in elders with hypertension. J Shahrekord Univ Med Sci 2006;8:45-51. Sarkar S, Chadda RK, Kumar N, Narang R. Anxiety and depression in patients with myocardial infarction: Findings from a centre in India. Gen Hosp Psychiatry 2012;34:160-6. Rahmani R, Yazdi RA, Motahedian E, Rahimi A. To assess the effect of planed meeting on the physiologic indicators of the patients who suffer from acute coronary syndrome. Iran J Crit Care Nurs 2013;6:57-64. Siavash-Vahhabi Y. The effects of music therapy and relaxation techniques on anxiety of patients in ICU. Andisheh Va Raftar 2003;8:75-82. Mirbagher Ajorpaz N, Aghajani M, Shahshahani M. The effects of music and Holy Qur'an on patients anxiety and vital signs before abdominal surgery. J Mashhad Univ Med Sci 2011;1:63-76. Roohi G, Rahmani H, Abdollahi AA, Mahmoudi G. The effect of music on anxiety and some physiological variables of patients before abdominal surgery. J Gorgan Univ Med Sci 2004;7:75-8. Ansari-Jaberi A, Negahban-Banaee T, Sayyadi-Anari AR, Agha-Mohammadhasani P. Qur'an recitation effects on depression in patients hospitalized in psychiatry department of Rafsanjan Moradi Hospital. J Kurdistan Univ Med Sci 2005;10:42-8. Sadeghi H. Voice of quran and health: A review of performed studies in Iran. Qur'an Med 2011;1:33-7. Majidi A. Qur'an recitation effects on anxiety of patients before coronary angiography. J Guilan Univ Med Sci 2004;13:61-7. Shirvani M, Mirzaeian R, Ghaderi A. The Effect of Holy Qur'an Sound on Vital Sign and SpO2 in Unconscious Patients Hospitalized in the ICU. 3th Provincial Congress on Qur'an and Health; 2013. p. 17-23. Ghasem-Tabar N, Fayyaz I, Ghasem-Tabar A, Omidi H. The effect of Qur'an recitation on anxiety of students. Biquarterly J Islam Educ 2013;8:101-16. Maleki M, Ghaderi M, Ashktorab T, Nooghabi HJ, Zadehmohammadi A. Effect of light music on physiological parameters of patients with traumatic brain injuries at Intensive Care Units. Ofogh E Danesh GMUHS J 2012;18:66-75. Mirbagher-Ajorpaz N, Ranjbar N. Effect of Qur'an recitation on anxiety of mothers before cesarean section. A randomized clinical trial. Qom Univ Med Sci J 2009;4:15-9. Hojjati H, Afra A, Dehghani A, Alostany S, Dehghan BH, Pourkhani S. The effect of music therapy on hemodynamic in patients undergoing caesarean section in Hakim Jorjani Hospital in Gorgan. Med Surg Nurs J 2013;2:122-7. Keshavarz M, Eskandari N, Jahdi F, Ashaieri H, Hoseini F, Kalani M. The effect of holly Qur'an recitation on physiological responses of premature infant. J Semnan Univ Med Sci 2010;11:169-78. Ildarabadi E, Saleh-Moghadam AR, Elmi MS, Ghanbari BA, Mazloom R. Effect of Qur'an recitation on anxiety in patients with open-heart surgery. J Mashhad Schl Nurs Midwifery 2003;5:15-20. Majidi SA. Recitation effects of Holy Qur'an on anxiety of patients before undergoing coronary artery angiography. J Gilan Univ Med Sci 2004;13:61. Bally K, Campbell D, Chesnick K, Tranmer JE. Effects of patient-controlled music therapy during coronary angiography on procedural pain and anxiety distress syndrome. Crit Care Nurse 2003;23:50-8. Ardalan M, Manaseki P, GHazi-Zadeh A. The effect of presence of visitors near the bed of the cardiac patients on the cardiovascular indices. Sci J Kurdistan Univ Med Sci 1998;2:18-23. Asghari K, Lotfi M, Aghazadeh A, Abdollahzadeh F. Effect of preoperative nursing visit on preoperative anxiety in patients waiting for operation: A randomized study with control group. J Caring Sci 2007;8:4-12. Ahmad-Soltani M. The Language of Research. Tehran: Jahad Daneshgahi; 2006. Ghasemi TM, Musarezaie A, Moeini M, Naji-Esfahani H. The effect of spiritual care program on ischemic heart disease patients' anxiety, hospitalized in CCU: A clinical trial. J Res Behav Sci 2012;10:554-64. Noureddine S, Arevian M, Adra M, Puzantian H. Response to signs and symptoms of acute coronary syndrome: Differences between Lebanese men and women. Am J Crit Care 2008;17:26-35. Yusuf S, Bijsterveld NR. Effects of clopidogrel in addition to aspirin in patients with acute coronary syndromes without ST-segment elevation: The clopidogrel in unstable angina to prevent recurrent events trial investigators. N Engl J Med 2001;345:494-52. Wang SM, Kulkarni L, Dolev J, Kain ZN. Music and preoperative anxiety: A randomized, controlled study. Anesth Analg 2002;94:1489-94. Bagheri-Nesami M, Heidari Gorji MA, Rezaie S, Pouresmail Z, Yazdani Cheratie J. Effect of acupressure with valerian oil 2.5% on the quality and quantity of sleep in patients with acute coronary syndrome in a cardiac intensive care unit. J Tradit Complement Med 2015; 5:241-7. Ildarabadi E, Saleh-Moghadam AR, Elmi MS, Ghanbari BA, Mazloom R. The effect of Qur'an on anxiety of patients with open heart surgery. J Nurs Midwifery Schl Mashhad Univ Med Sci 2002;5:15-20. Bae I, Lim HM, Hur MH, Lee M. Intra-operative music listening for anxiety, the BIS index, and the vital signs of patients undergoing regional anesthesia. Complement Ther Med 2014;22:251-7. Shafiei N, Salari S, Sharifi M. Comparison between hearing the Qur'an Arabic voice and Arabic voice with Persian meaning on decreasing the anxiety and vital signs stabilization of patients before induction of anesthesia. Q Qur'an Med 2011;1:11-5. Lolaty HA, Bagheri-Nesami M, Shorofi SA, Golzarodi T, Charati JY. The effects of family-friend visits on anxiety, physiological indices and well-being of MI patients admitted to a coronary care unit. Complement Ther Clin Pract 2014;20:147-51.